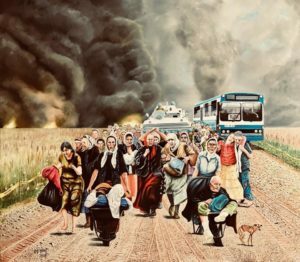 Our Vice Chair Robert McNeil’s latest painting depicts an element of the terror experienced by thousands of half starved women, children and the elderly, escaping the Bosnian Serb army after being ethnically cleansed from Srebrenica in July 1995 following a prolonged siege that began in 1993. As this was happening, over 8 thousand of their men were being murdered and buried in mass graves after being handed over to the Serbs by UNPROFOR (UN ‘Protection’ Force). Many of the women suffered terrible sexual abuse. Scene’s like this are repeated in other countries to this day. Some of the people are based on photos from the internet.